Maybe there is no person, who didn't experience pain in the lower back at least once in the life.It's especially common problem among those, who spend a lot of time sitting at the computer. This causes excessive pressure on the ligaments and muscles. Painful sensations in the lower part of your back may occur not only because of spine and muscular disorders, but also as a result of problems in the internal organs, like womb, ovaries, kidneys etc. Although both men and women suffer from lower back pain, female pelvis is more complicated structure. That's why women experience discomfort in the back more often than men. It may be also about hormonal changes of the female organism, occurred naturally in the course of the life or because of certain health problems. 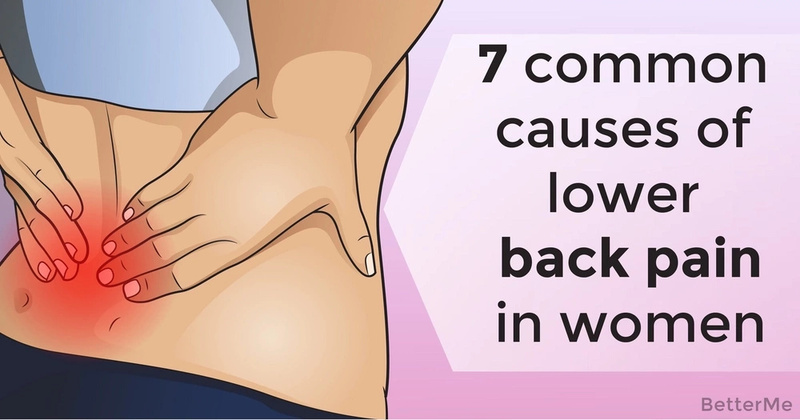 So, ladies, what are the most frequent reasons for pain in the lower back? #1. Coccydynia – so-called tailbone pain is rather uncommon trouble but it may happen. In this condition, sitting, riding and everything that puts pressure on the tailbone, causes severe back pain. Statistics shows that women have five times higher risks for experiencing coccydynia than men. #2. Uterine tumor – uterine fibroids are benign overgrowths, which are commonly painless. However, certain types of myoma may compress surrounding nerves, causing backache. #3. Herniated disk – disks are cushions, which separate your spine bones from each other. With aging, outer layer of the disk becomes thinner that may allow gelatinous matter in the center of the disk to bulge out. Slipped disk may squeeze the nerves, leading to pain and numbness in the back and hips. #4. Ovarian tumor – like in the case of uterine fibroids, ovarian tumors may grow large enough to press the nerves. Sometimes ovarian tumors may result in torsion or rupture that produces abrupt unbearable pain in the low back. Malignant neoplasms have ability to spread to the neighbor organs and even to the bones, causing different unpleasant symptoms. #5. Kidney stones – sometimes hard deposits may develop in the kidneys and then travel to the bladder. When they pass through the ureter, you may suffer from extremely severe pain that makes difficult even to perform daily tasks. #6. Endometriosis – endometrial tissue, which lines inside the womb, may spread out of its natural location to the ovaries, abdomen etc., causing irregular periods, back pain and intensive menstrual cramps. #7. Osteoporosis – you've probably heard that hormonal changes, associated with menopause, reduce bone density. Osteoporosis often affects spinal vertebrae and thighs, triggering pain in the lower back.